The appearance of Morbid Messiah is deceptive. This death metal quartet from Guadalajara, Mexico, look very young — no doubt because they actually are very young, especially in comparison to ancient creatures such as this writer. But when you listen to their music, you realize that they must have old souls — the souls of corpses who perished in horrible fashion and have been reanimated into ghastly new lives. 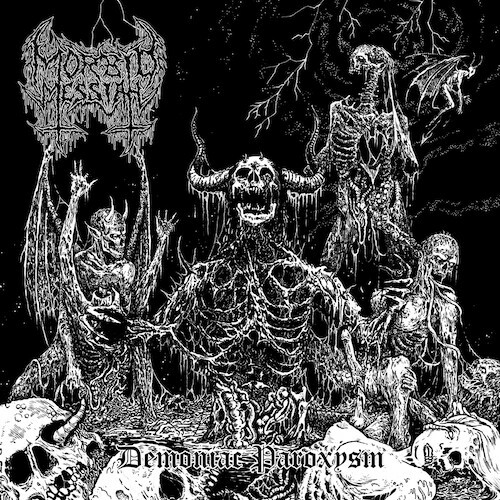 Morbid Messiah‘s debut EP, In the Name of True Death Metal, was self-released in 2016 but was soon given a sold-out tape treatment by Godz ov War Productions. Their new album, Demoniac Paroxysm (adorned by the distinctive cover art of Mark Riddick), has attracted even more label interest, with a CD release coming on October 22nd via Memento Mori and a vinyl edition in the works from Unholy Prophecies. One song from the album (“Howling From the Grave“) has crawled from the crypt already, and today we have a second one: “Graveyard Headhunter“. The music displayed in both tracks is plainly rooted in old school death metal from the earliest days, with a sound that’s foul but authentic. Both tracks radiate a livid, ghoulish energy, and both prove to be quite addictive. “Graveyard Headhunter” is an irresistibly head-bobbing song, propelled by skull-snapping snare beats and the thump of a pulse-pushing bass. The ancient sound of rotting death comes from a filthy, roiling guitar sound and equally nasty chords that bludgeon and jolt, as well as the vocalist’s disgustingly foul guttural growls. The whole thing sounds like a subterranean cesspool that’s been whipped into a froth by a monster writhing within the putrescence. That earlier track, “Howling From the Grave“, has a more mid-paced and lurching gait at first, as corrupted as a reanimated corpse, but then surges into a brawling, boiling rampage through a burst of double-bass and freakish soloing. There’s a second horrifying solo in the song, as well as proof that the vocalist can shriek as well as growl — and it will get your head moving just as effectively as the song we’re premiering today. Man, those were awesome. Nice mix of dark atmosphere and head-bangy moments.